KISS 1983: Uh, guys, so you’re NOT wearing makeup anymore, right? The news of KISS removing their signature makeup would, in a sense, overshadow the fact that Lick It Up was a nitrous-fueled muscle car. From the opening crash-palace of Exciter to the bestial crunch of Not For The Innocent, from Stanley’s rap stylings in All Hell’s Breaking Loose, to Gene’s sleaze in Dance All Over Your Face, KISS’s 11th studio album (15th if counting the Solos) builds on the foundation laid by 1982’s Creatures Of The Night – a hard rock/heavy metal Last-Of-The-V8-Inteceptors that would go double-platinum. Something so appealing about that minimalist cover. White. Classic. 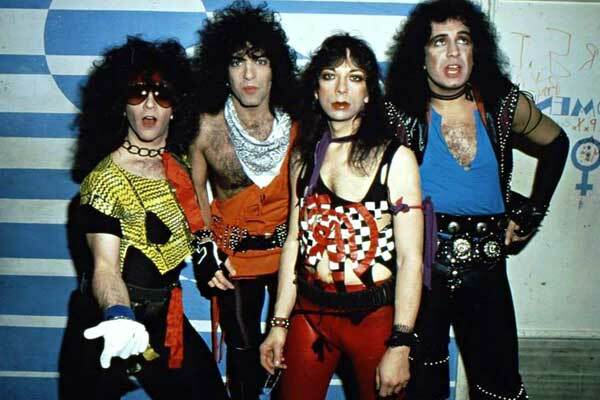 Showing the four current KISS members at the time – sans makeup: Vinnie Vincent, Eric Carr, Gene Simmons and Paul Stanley. The album would be released on the day KISS “unmask” on MTV, September 18, 1983. 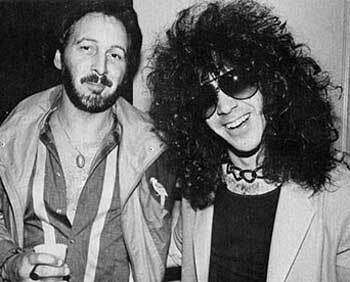 It was a day of uncertain optimism, because Our Heroes were seemingly moving past their infancy, and simultaneously a day of embarrassment for Simmons and Stanley, having to put up with Vinnie Vincent answering questions authoritatively, as if anyone really cared what he looked like – he had only been “masked” for one tour and never featured in full costume on the cover of any album (not even the one he played on – Creatures!). One of the cooler props retained from the Creatures tour – the drum riser tank turret that rotated and “fired” and smoked, complete with tank-tread foley. Exciter. Paul Stanley throws down the gauntlet on the opening track. At the top of his game, no vocalist on Earth can show this man how it’s done at this moment in his career. There is a steaming guitar solo by session player Rick Derringer. But before the wrath of the solo, there is the leadup, the memorable “hummable” part – and it’s great to hear KISS have not forgotten that philosophy. Derringer firmly bridges Frehley and Vincent (we would never have been able to tell it was neither Spaceman nor Wizard), in a cacophonous delay solo like the plaintive cries of the Gaos birds before they attack Gamera. Not For The Innocent. “I spit the hangman in his face / And hung him with his noose…” The heavens shudder as Gene Simmons unleashes this steel-thumping paean to being R-rated. The pendulum was definitely swinging the other way with this release; gone were the primary colors of the disco era, gone was that which defined KISS in those glitter days – the makeup – which now seemed to belong to a more innocent era. Made heavier by that 6/4 bar thrown in at the head of each chorus line, then sealed with the ferocious way Simmons attacks the first word: “NOT for the innocent…” And when he sings the last line, “Let the beast run WILD…” I swear he’s turning into a werewolf. 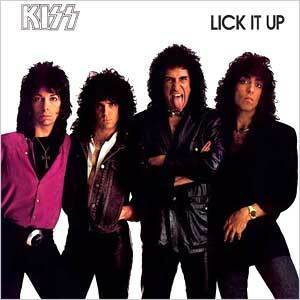 Lick It Up. Ordinary V-IV-I chugger with extraordinary vocals. Stanley is singing so high (up to C#5 and E5) that it makes the song worth listening to. We never quite appreciate how good Stanley is, and has been all his life, as a vocalist, because we have grown accustomed to hearing him belting these acrobatic vocal lines – until we hear a vocal coach analyzing it. 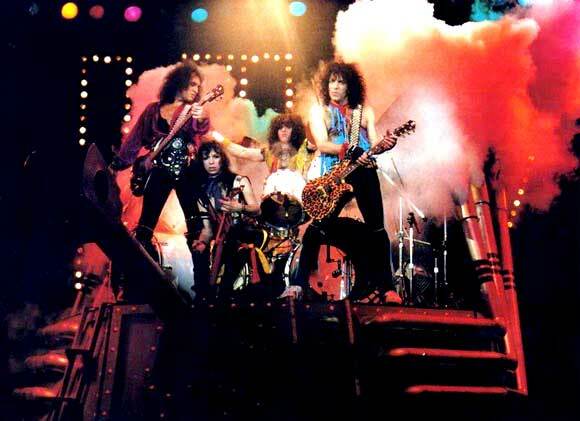 Lick It Up would be the first single – and first VIDEO – of KISS without makeup. Just like the unmasking, the video is cool and funny and embarrassing all at once. We don’t really care about the apocalyptic theme or the warrior women; we’re just here to see KISS not being Demon Starchild Fox Wizard. It’s cool to see Gene and Paul bare-faced (let’s face it: they were the curios, not Eric or Vinnie) – with or without makeup, they’re gonna exude those personas; Eric chugs along beside them like a little huggy bear, trying not to get bodily pushed out of frame by Gene’s burgeoning mass; and skinny, androgynous Vinnie? Well, most people thought, “I didn’t know KISS had a girl in the band now!” (Actually, he does look kinda like a crazy ex-chick of mine… Hmm…) Why you lookin’ so tough, man? Nobody knows who you are. As usual, we see songwriting credits for Stanley or Simmons next to their songs, but there is one name that constantly appears beside both names – Vincent. In total, he has eight co-writing credits on this album; that’s more than either Stanley or Simmons! Paul’s ballad on this album A Million to One is a syrupy-thick cruncher, written for Donna Dixon, the lady he lost to Dan Aykroyd– waitaminute! On the last album, he wrote I Still Love You for Dixon as well. Let it go, man! Let it go! There was a million to one chance KISS would ever find a guitarist that suited them after Ace’s departure circa 1981 (wild talk of Eddie Van Halen, Bob Kulick, et al), and there was also a million to one chance that someone scrounging on the LA metal scene and sleeping on furniture-less floors would be hired by KISS. Planets aligned, and Vincent John Cusano saved Creatures Of The Night. 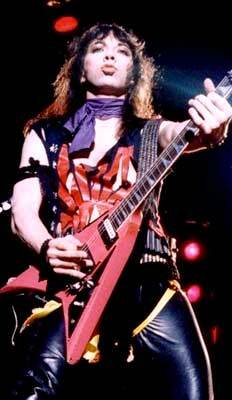 In the short time it took to change his name, become the “Ankh Warrior,” tour the world, record another album, and unmask, the reborn Vinnie Vincent would become the “knucklehead” that Simmons constantly accuses him of being. Two million-to-one chances stack-heeling on top of one another – and Vincent blew them both! Can anyone conceive of the conceit of this guy to claim that KISS was holding HIM back? Of course, this is history written by the winners again, as Vincent is M.I.A. from the music scene, so we never hear his side. But then, isn’t that indicative of the veracity of KISS’s claims? Released: Sep 1983, Mercury Records. 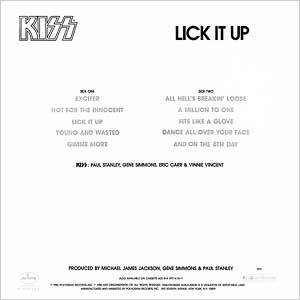 Produced by: Michael James Jackson, Gene Simmons, Paul Stanley. by Jon Dunmore © 9 Nov 2015.